Still feel the same, whiskey gone and Cognac nearly gone. Gave in and went to the doctor. Got an appointment for 1145. Went back and saw a very young lady who spoke English with an American accent. Antibiotics and a nasal spray. Felt a bit dizzy but was feeling better when we went to bed. It's our wedding anniversary today - 48 years. Not bad is it. I'm still not right so we decided not to go out tonight. But definately getting better. Went to the post office and collected the parcel they've been trying to deliver all week. It would help if they drove down the drive to the house. It was more parts from Roger Furneaux, but not all. I'll ring him when I get a minute. Did nothing. feeling better. end of post. I was planning to look at the carbs on the MG but if you heard the torrent of abuse I got you'd do as I'm doing, sitting down doing nothing. This is getting boring so I go to the doctor. My doctor is not in on Wednesdays so I see a very nice young lady who prescribes antibiotics. The antibiotics are beginning to work. Still feel rough but sort of better rough. Have to go shopping. We skip the lunch but I have to go back to the car and Lynne finished the shopping. No football today so just bored. I'm feeling better today. But the antibiotics are making me feel sick and I'm off food. I work on the Mini all day. Well paint the front subframe with Kurust in the morning then have two hours for lunch. After lunch the subframe is still wet so I work on the MG. Take the front carb apart and stop a small leak from the main jet assmebly and lower the needle a fraction. It runs a bit better after I've put it all back together. The antibiotics are finished but I still feel a bit sick and off food. Was going to work on the Mini but felt too sick so watched TV all day. Physio at 0900, picked up an outstanding prescription for Lynne from the doctor, posted two letters, both payments (tax and hospotal bill), dropped the prescription into the pharmacy and went home. We went to Chateu Gontier to collect the saucepan lids but they're still not in. Next Wednesday then. The road from Chateau Gontier to Lion D'Angers is closed so we have to go back to Segre and then on to Atoll for lunch. Several weeks ago, well probably two months now, the little flap on my camera battery compartment broke. I took it back to the shop I bought it but they said it's not under warranty. It's only 5 months old so it should be. We went back today and they want 39€ to look at it then the price of parts and labour.I told them to forget it and will send it back to Sony for repair. 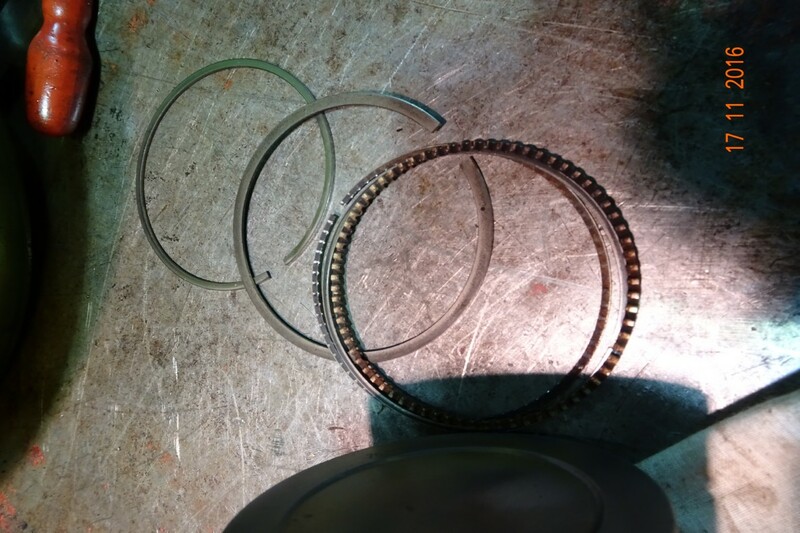 One of the managers said he thought they should replace it with a new one but it wasn't his area, We then went to the BMW dealer to pick up the parts and found they pulley is off the crankshaft. 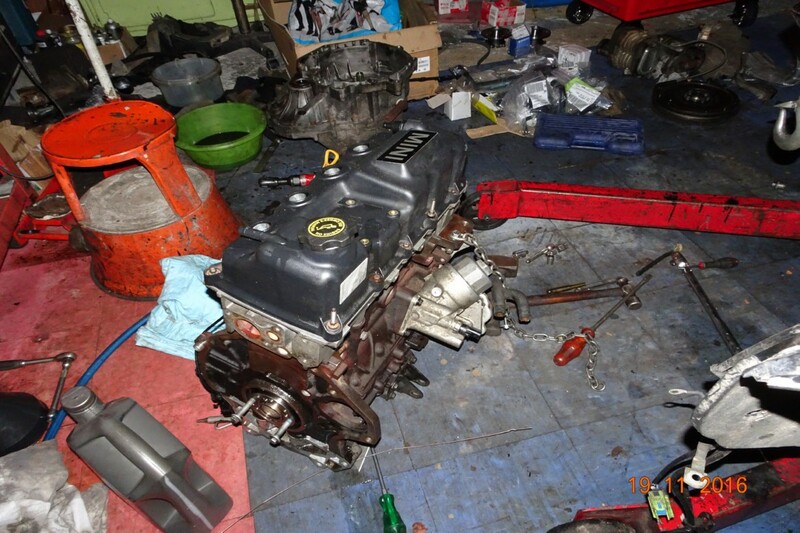 The engine is now in the boot of the Honda, I'll get it out tomorrow. 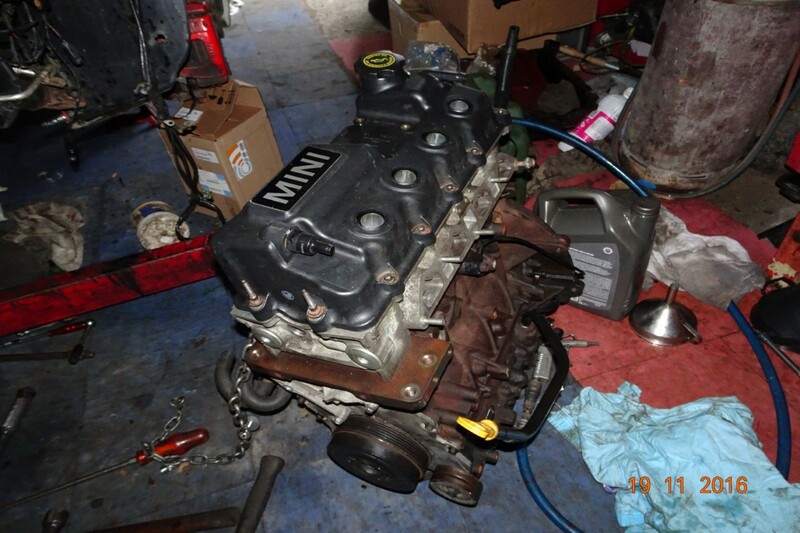 Got the MG out and removed the engine block from the back of Lynnes car. Put the MG back as it started to rain. 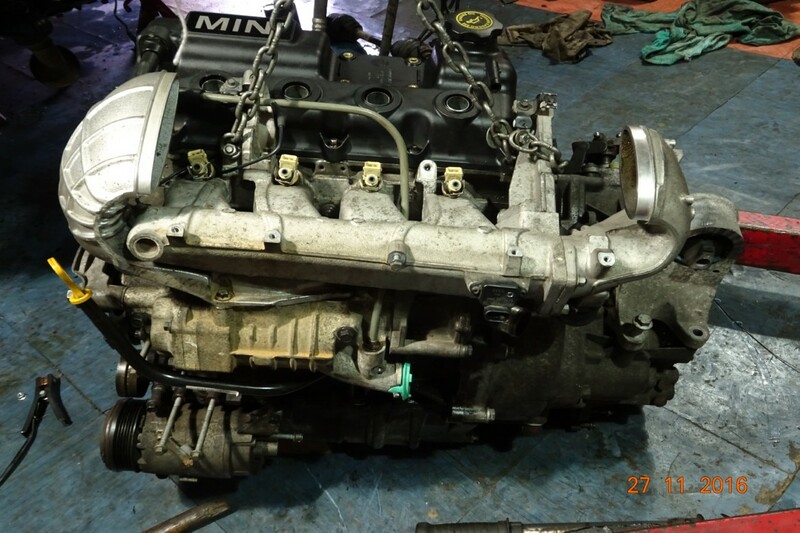 I put the block on the trolley and moved it to the front of the Mini then started work on removing the crankshaft. Like the Rover K series the BMW engine has a crankshaft bearing ladder It all came apart fairly easily and I then drew the pistons. Cleaned up and new rings fitted it was time to clean the bores. Some 600 grade wet and dry did the job very well. 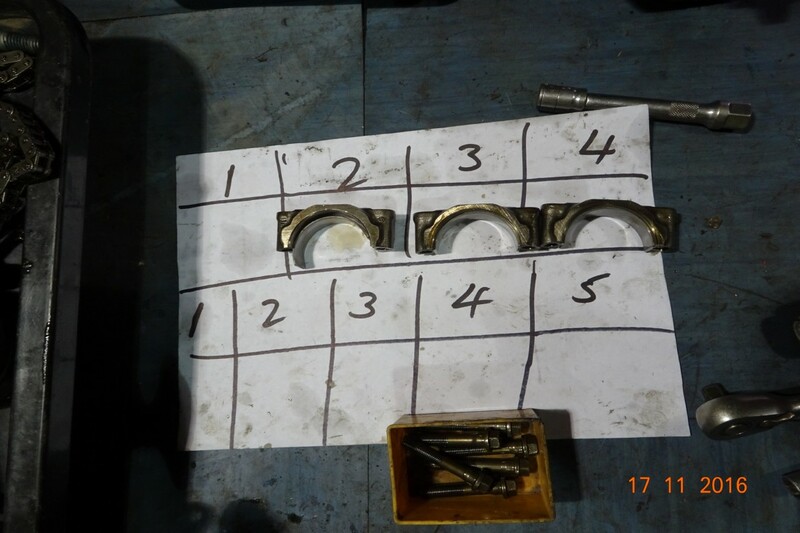 The pistons went back without too much trouble, other than number four (fitted first) where the oil control ring wouldn't compress. I think the wavy bit between the two rings was getting caught. I bit of wiggling sorted that and all four where in. Then to lay the crankshaft in and then fit the ladder over it. The rods were attached to the crank and the ladder bolts done up. 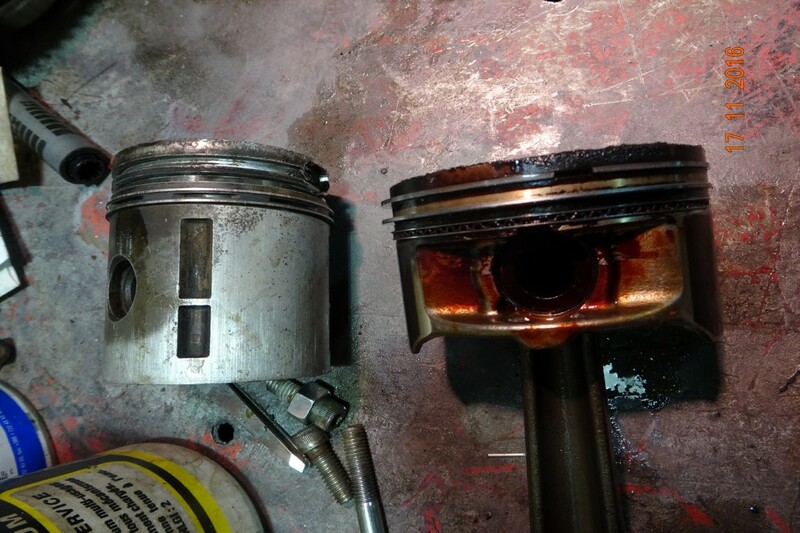 The engine was on the bench and that's where I left it, basicilly as it was when I started other than it now has clean pistons and bores, new piston rings and all ne big end and main bearings. 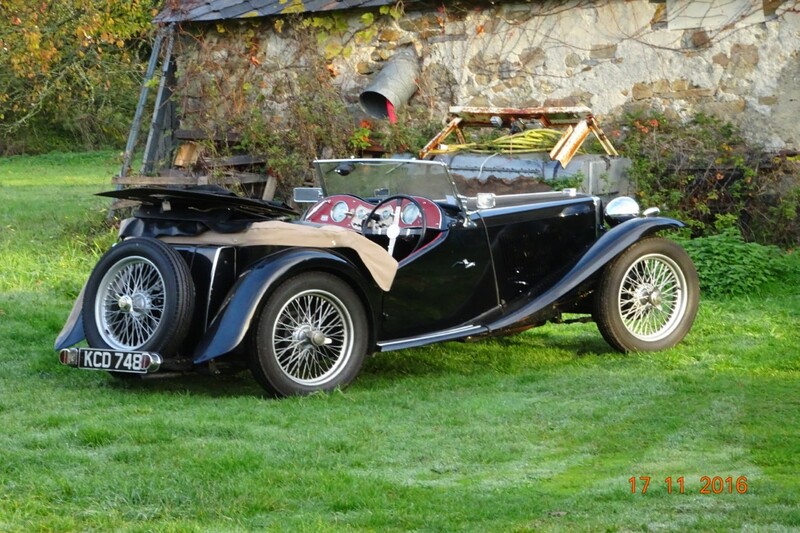 The MG, sitting outside whislt I get the block out of Lynnes car. The stuff on the back is the sidescreens and under dash cover, yet to be fitted. 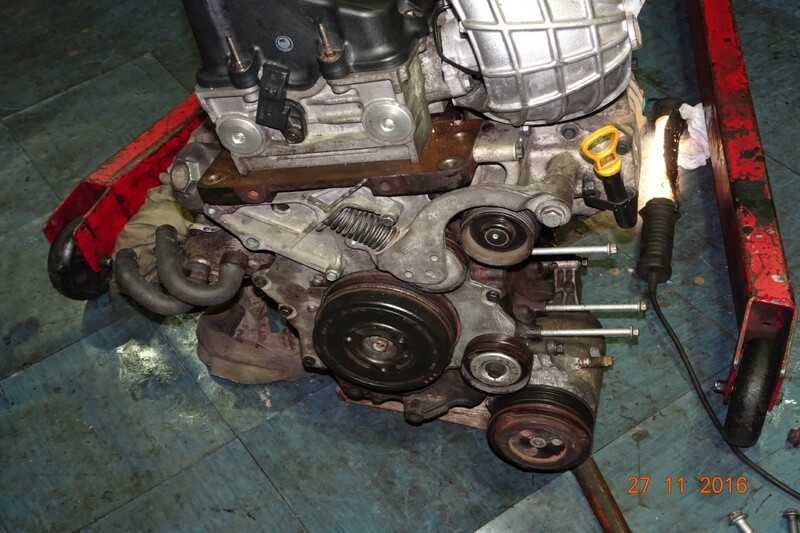 The front cover of the engine with pully removed. Big end caps and bolts. 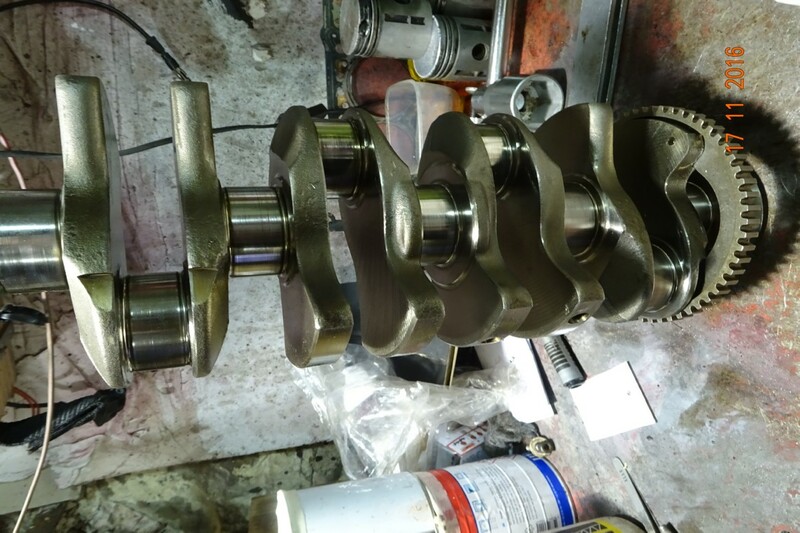 The crankshaft. The pistons at the back are from the TC. The difference eighty tears makes. 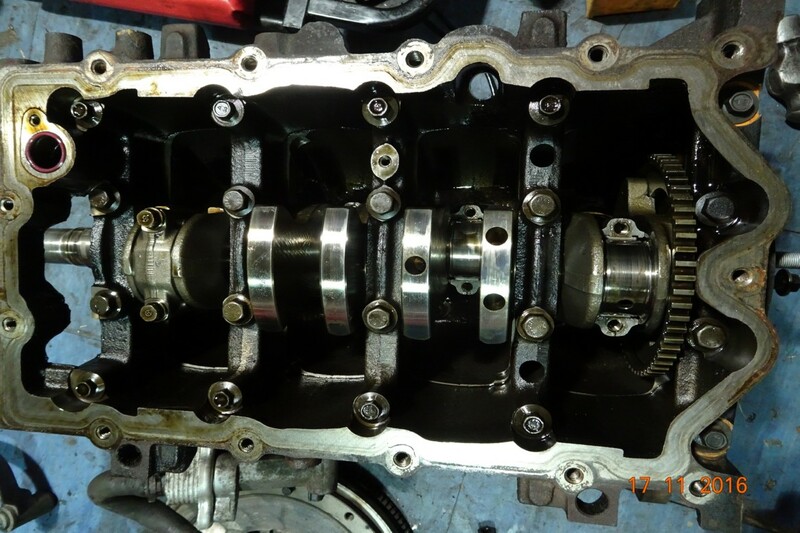 The XPAG crank next to the BMW Mini crank. 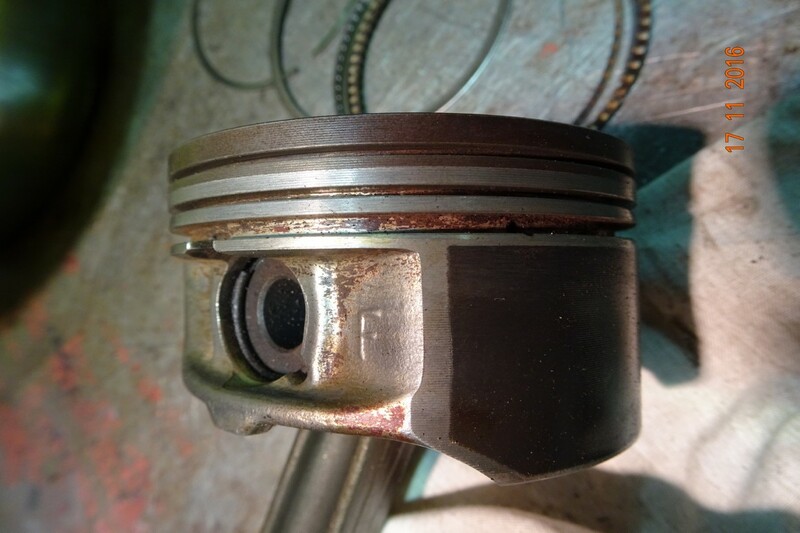 A Mini piston after cleaning. In the groove. The red is engine oil lacquer. I wasn't aware you got it with synthetic oils. Spick and span, ready for refiiting. This is what they look like before cleaning. Lots of lacquer and gungy oil. 80 years of piston development. Not a lot when you think one was designed 80 years ago. 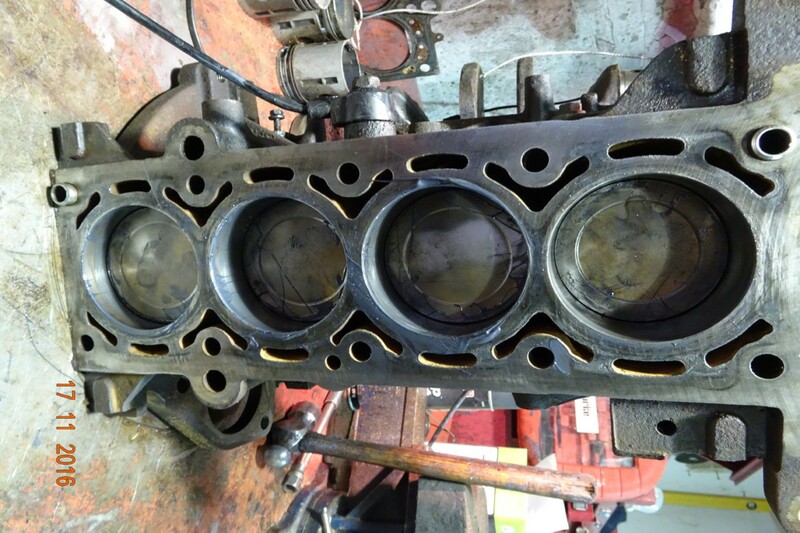 All four pistons back in. They have graphite grease around them. The bottom end. Waiting for the crank to be refitted. 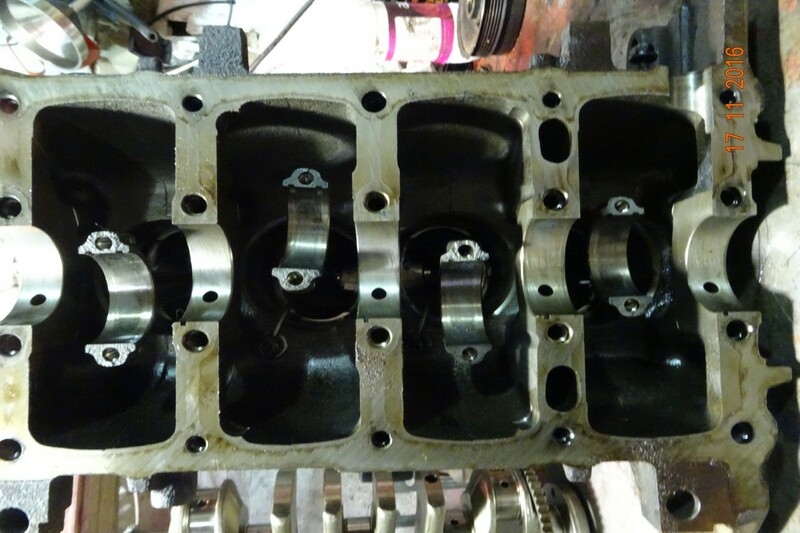 Crank and rods refitted as well as a new sump gasket. Shopping day. I have been on to France Telecom again and the completion date for the work in the exchange is now 1800 23rd. I'm taking bets they don't finish in time let alone on that day. Anyway, I can go to an Orange shop and collect an "Airbox". Nearest is in Chatueubriant so off we go, after physio. An Airbox is basiclly a phone without a screen. The sim card and battery are inserted for me and we're on our way. Next port of call is the optician. He examines me right away and somewhat disagrees with the professor at the eye clininic who said the first course may not have worked due to my suspected sleep apnea. The optician says there are three factors of which sleep is one. All three must be "good" for it to work. OK, so I'm now given the prescription and booked in for the firts injection next Thursday. I have to go to the doctor for something to keep me calm, like heroin! We then make our way to Buffalo Grille and have lunch. Last is the actual shopping. I sit in the car and Lynes goes in. She takes ages anf comes out in a bit of a state. She can't find anything in this store. We go home, get the shopping in and both fall asleep. Start by fitting the last valve cotter to the last valve in the head (remember I lost one). Cotter in and both faces cleaned the head gasket and head go on. 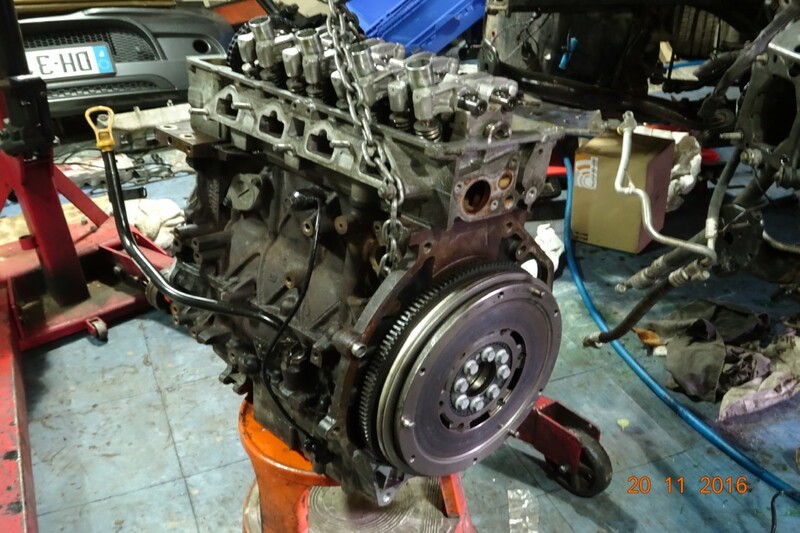 Then the timing chain is aligned and fitted follwed by the two chain guides. The guides are bolted at the top with one having a slot to fit into a peg and the other just lays there. The tensioner will push against the loose one keeping the chain tensioned. The old tensioner, the one the tensioner pushes against, had broken up and the sump was full of broken bits of plastic. 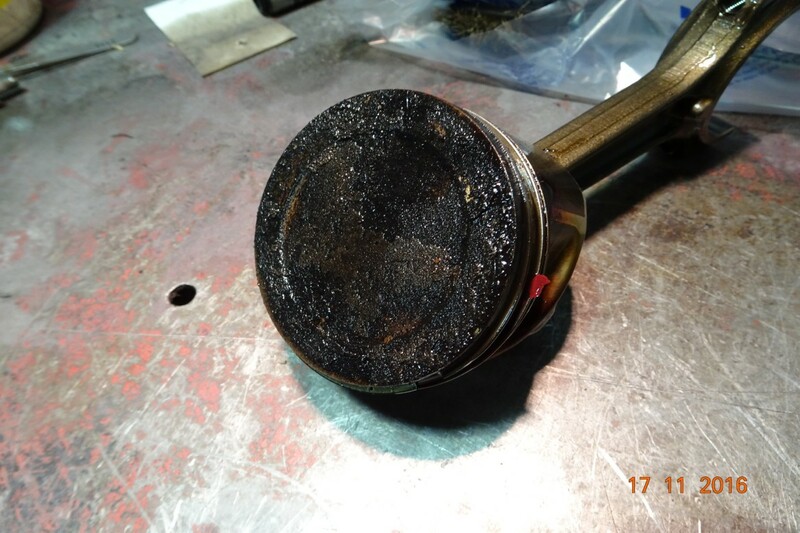 There were several broken bits over the oil pick-up screen. 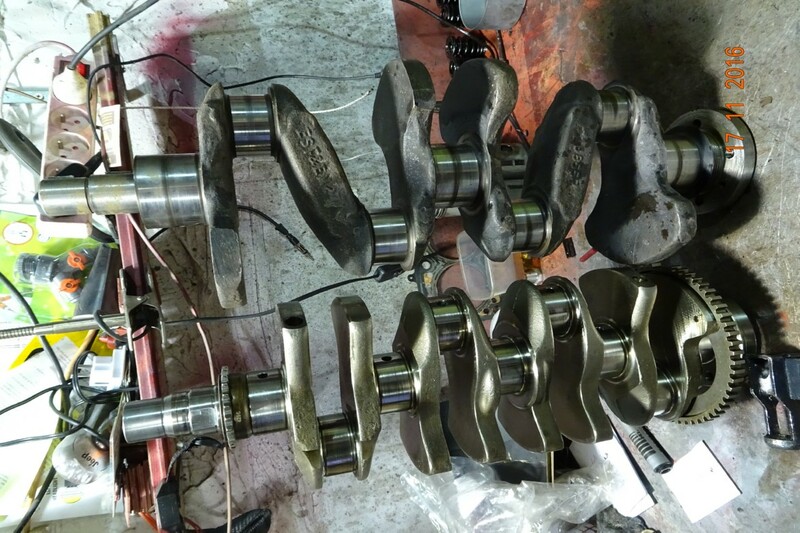 Next was the camshaft and the two rails of rockers. A bit fiddly but they were all on. 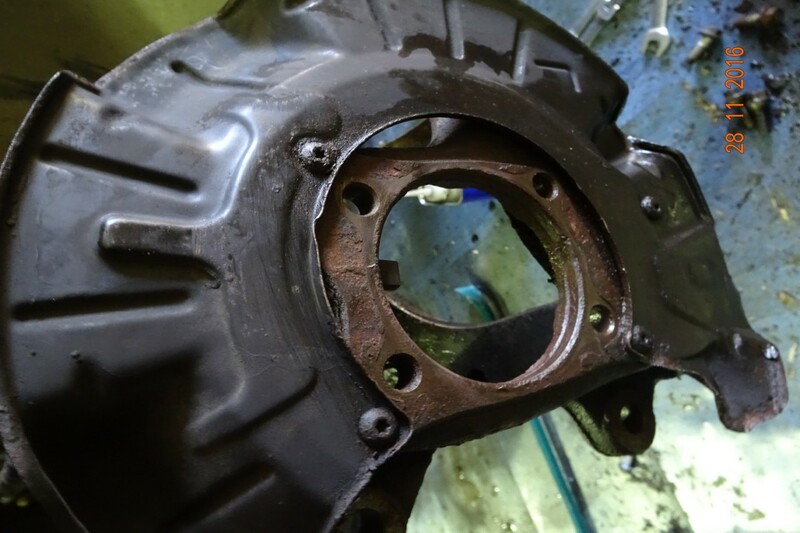 The timing cover was fitted next after a good clean. Lunch, soup and a bread roll baked hot in the oven. Very nice. Back to work within an hour. 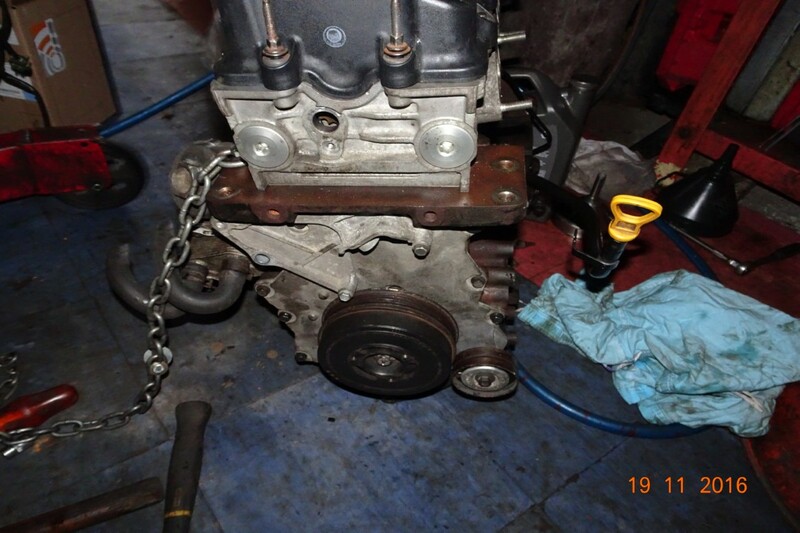 I then put a chain on the engine and lifted it off the bench onto the floor. I got it up most of the way then it slipped off the bench and just hung in mid air swinging, no harm done. On the floor the camshaft cover was cleaned, a new gasket fitted and it was put on. Then for the oil. Five litres of good 10w/50 was poured in. At this poiunt I went in, showered and changed and watch the football scores coming in. Started at 0900. 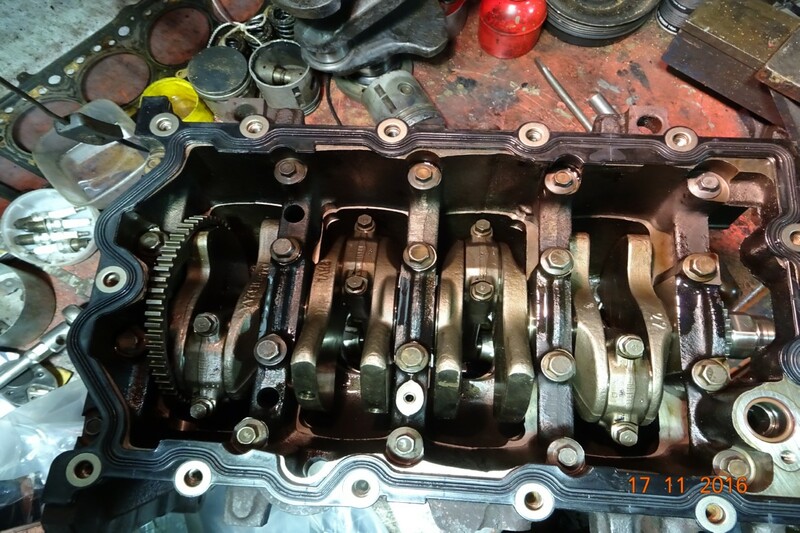 Took the cam cover off and poured oil over the chain and the camshaft and rockers. I forgot yesterday. Next the flywheel was fitted, I needed my lovely wife's help as I couldn't hold the flywheel and fit the bolts. First attempt was a failure as the bolts are not equally spaced so we took all the bolts out, turned the flywheel and tried again. They all went in this time. 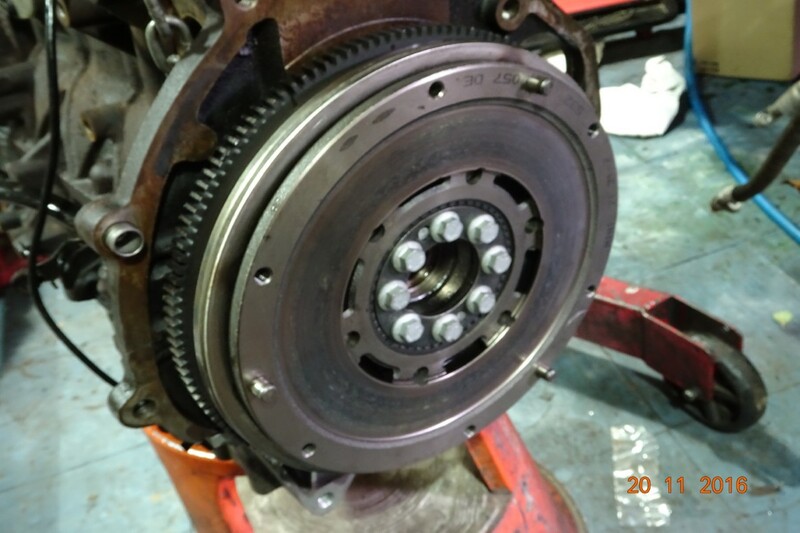 The clutch was fitted and aligned by eye. I would have made a spigot shaft but theer is no spigot bush on the end of the firts motion shaft. Now the problem started. 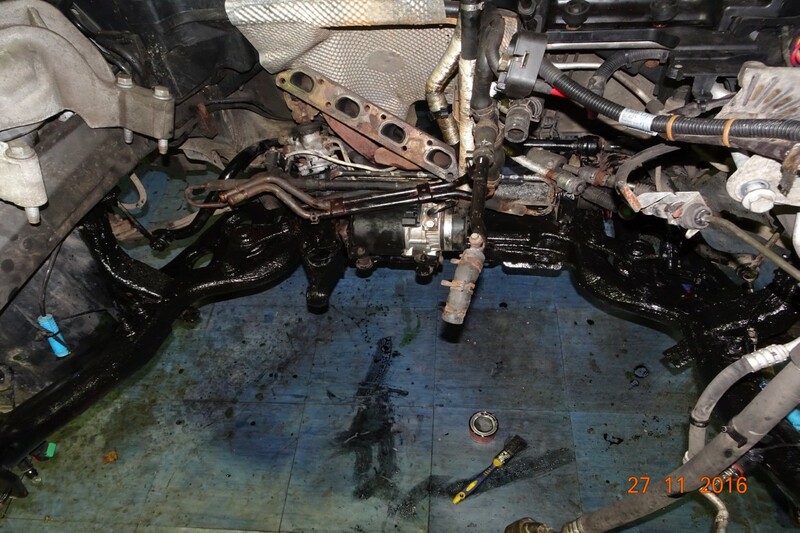 I tried to fit the engine to the gearbox, having fitted new drive shaft oil seals. No chance. 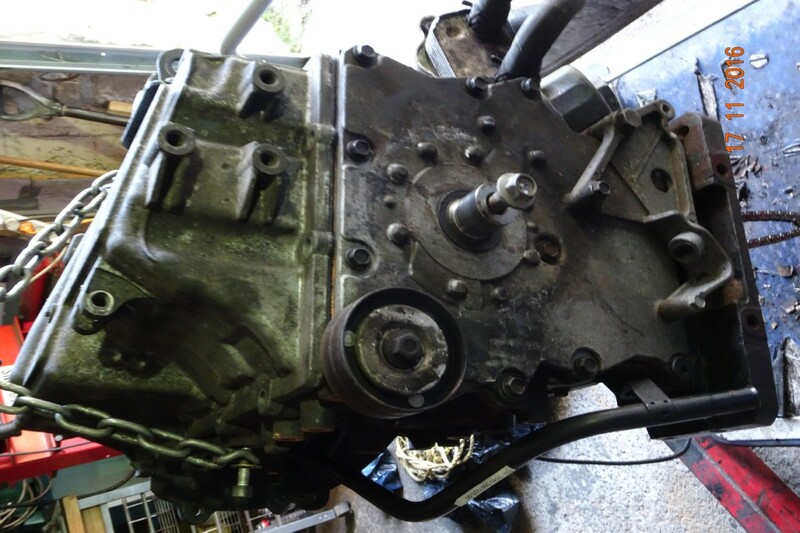 I then laid the gearbox on it's back with the shaft pointing up, fitted the chain to the front end of the engine and tried dropping the engine on the gearbox. No chance. 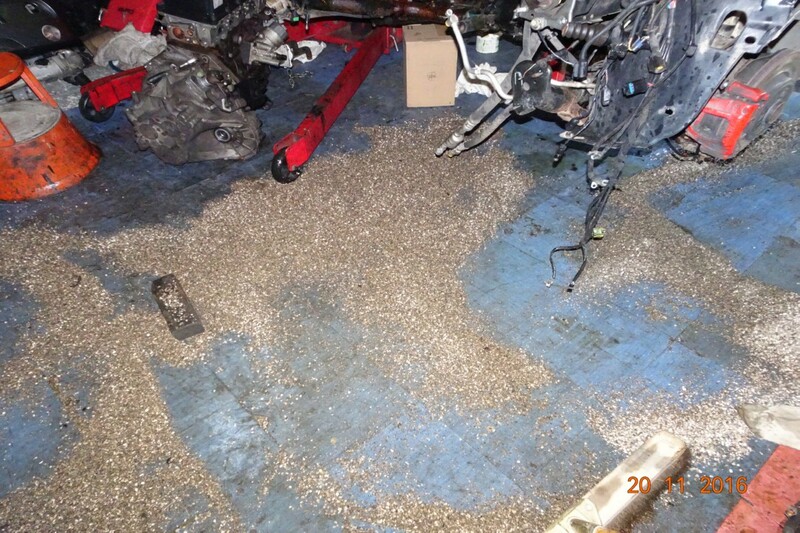 BUT... all that nice new engine oil ran out all over the floor. It came out the hole in the block for the TDC sensor. I then called Lynne and we tried together. No chance. We then took te engine of the box and stood the box up. We both looked at the centre plate and Lynne dccided it needed to go up slightly. Suitably raised we tried again. No chance. We now took the engine off the box and loosened the clutch bolts. 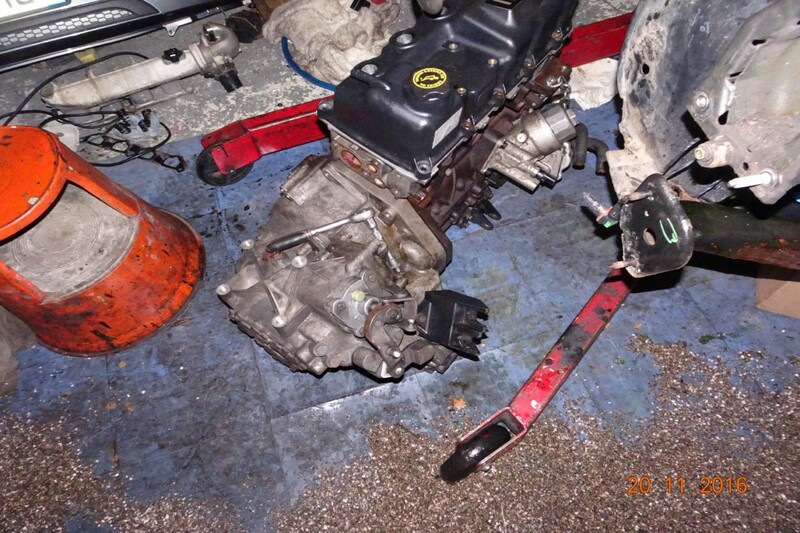 We now tried to get the engine to the gearbox. No chance. By this time we were both wilting so, seeing as it was 1230, we stopped for lunch. After lunch we both fell asleep. at 1500 I went back and tried again. It slipped in. So I removed the engine to tighten the clutch and then refitted it. However I can't find the bell housing bolts. I have used one of three bolts to hold the two together whilst I get the engine and crane out of the way so I can lay cat litter to soak up all my nice new oil. The engine, off the bench and fully assembled. Now to get the flywheel and clutch on. The other end with crank pulley fully bolted up. Close up of the pully. 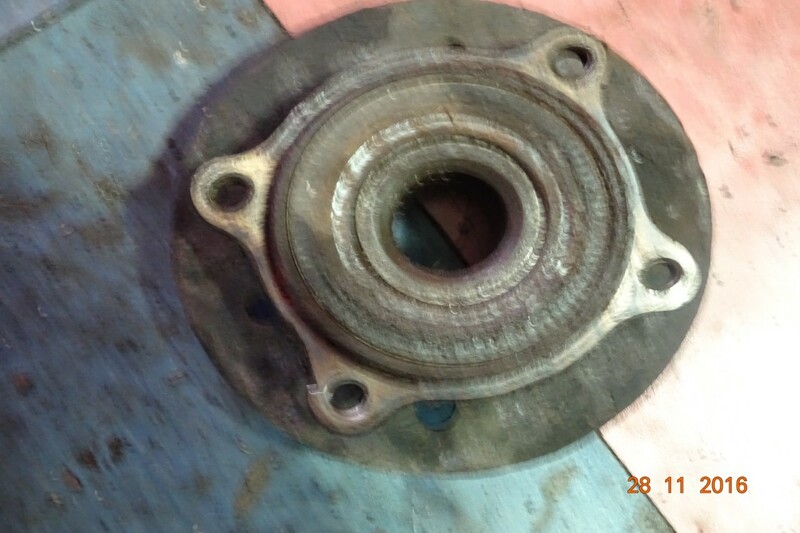 A close up of a flywheel. We don't have any cats but lots of cat litter to soak up oil spillages. Note the gearbox is now attached to the engine. Got dressed to go over to the workshop but then decided it was too wet and windy. Then two telephone engineers turned up and fixed the phone/internet. Only took three weeks. Spent the rest of the day catching up on phone calls and getting the blog up to date. It's now 1615 and I'm going to sit in my massage chair and then watch TV. I have phoned Will about the crankshaft sensor and sorted that out. 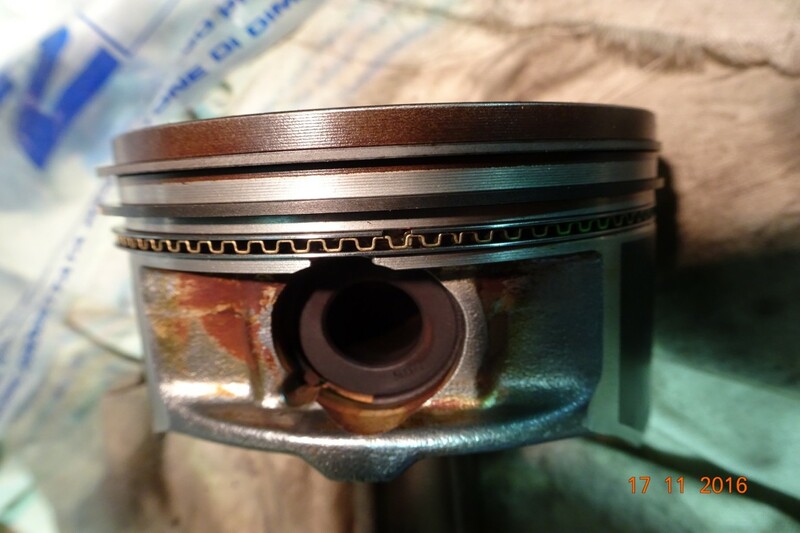 The sensor I have fits in the head in front of the camshaft wheel, the sensor that fits in the block seems to be lost. Internet gone again. I go to the doctor for something to calm me down when I have the eye injection. She proscribes me some pills. I get home and Lynne, as usual, looks them up on the net. These should not be proscribed to people with sleep apnea... never! So back we go to the doctor who explains she knows that but 5mg is OK. It may be OK but they're not doing anything. 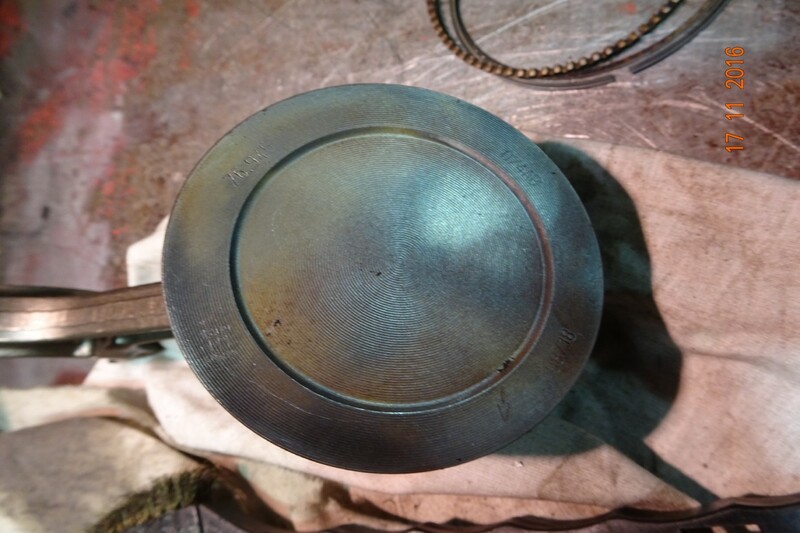 We go to Chateau Gontier to collect the saucepan lids. Then on to Atoll for lunch. After that we go to the BMW dealer to order another crank sensor then onto Been Frere to order a new alternator. Both should be in by next Wednesday.We end up at Kiabi a clothing shop where Lynne buys a top, I sit in the car. I was going to work on the Mini after physio but was told I had to rest my eye. I got the internet back on by swapping cables around, but still no phone. 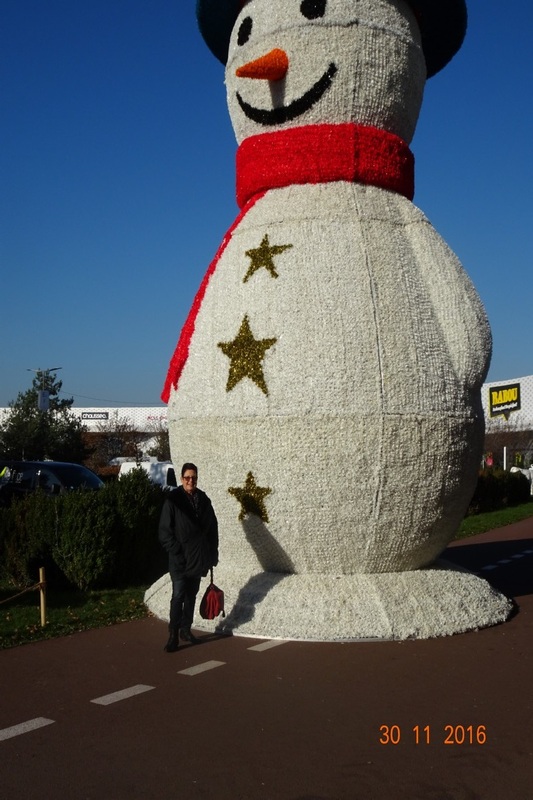 We normally go shopping at Intermarche at Segre. We have lunch in the cafe then shop. However I didn't feel like the cafe lunch so we went shopping at Super U in Pouance and then had lunch at Claude and Joel's and very nice it was. Got back at 1400, put the shopping away and fell asleep until 1530 when I put Final score on. Watch ten minutes and slept for half hour. Then after another feww minutes slept until the half time scores were coming in. More or less watch the second half. Slept through most of the evening TV then woke up to go to bed. Up and downstairs by 0830. Got dressed to work, had breakfast and went over to the workshop. Spent half hour cleaning up the cat litter and wiping the residue of oil on the floor. I found the bell housing bolts and got them all in including fitting the starter. Fitted the compressor (supercharger), inlet manifold, the spring loaded belt tensioner which needed Lynne's help. The home made tool slipped off the fulcrum bolt and hurt my darlings hand. I kissed it better. It also knocked my glasses off as I fell forward. I made another bar for the bottom section and Lynne came over again and we got the spring compressed enough to fit the drill bit in the second hole. I then fitted the air-con compressor. I filled the engine with oil, which reminds me I must get another 5 litres to make up for the stuff I spilt. I only have one problem at the moment. I have a bolt which is too long for the bell housing so swapped it with a shorter bolt from the engine mounting. Problem is the engine mounting bolt is now too long. It'll sort itself out by the time I'm finished. I then moved the engine out the way and painted the front sub-frame. I'm going to turn the engine over on the battery pack tomorrow to get oil pressure. I'll wire up the oil warning light switch to an ohmmeter so I can see when the pressure has put the light out-so to speak. The front of the engine with all (except the alternator) pulleys in place. 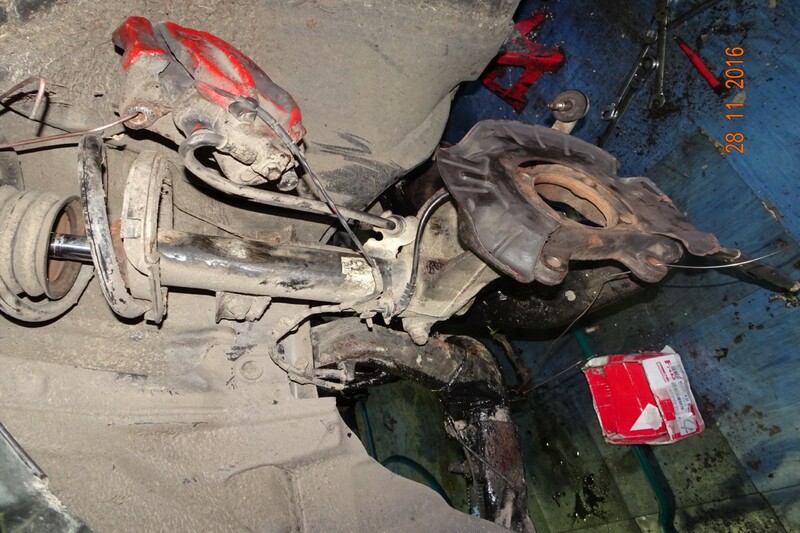 Note the drill holding the tensioner open. Also note the front inlet manifold bolt is now a bolt and not the stud and nut that was there. The stud and nut arrangement means you have to put the manifold on before the compressor. The bolt can go on with the compressor on. The compressor (supercharger) and inlet manifold. The air-con compressor is at the bottom and the three bolts hold the alternator (there's one behind the dipstick tube. Ever had a day when you wished you'd stayed in bed? Well I had one today. Started OK, I did a few small jobs on the pulleys, one needed "straightening" after being levered and tightened the belt tensioner pivot bolt. Then soldered a new wire to the air-con compressor which I'd had to pull out because the inline connector wouldn't undo. 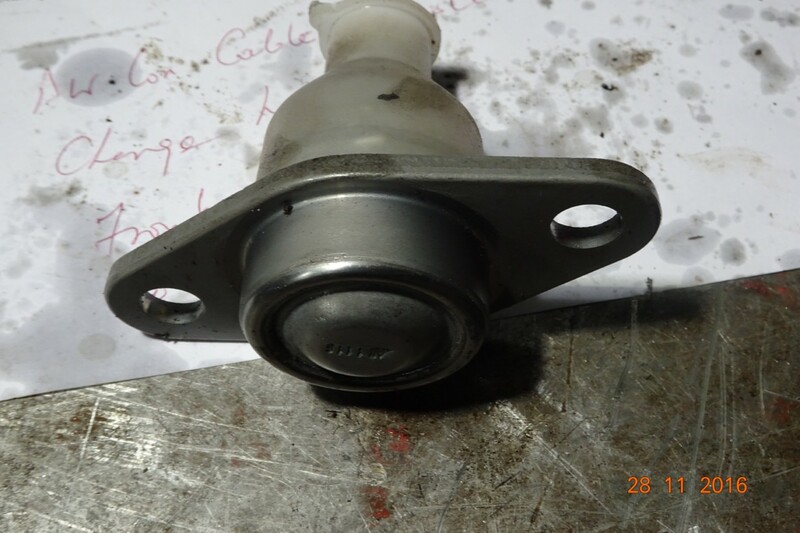 Now, did I tell you I couldn't find the crankshaft position sensor, I spent ages looking for it and in the end ordered a new one from the BMW dealer. 66€ plus 20% VAT. Oh well worse things happen at sea. So back to today. I needed to find the wire that goes to the air-con compressor so I could crimp a terminal to it to join to the new wire. I unravelled the mass of wires that go all over the engine and found the wire I was looking for. 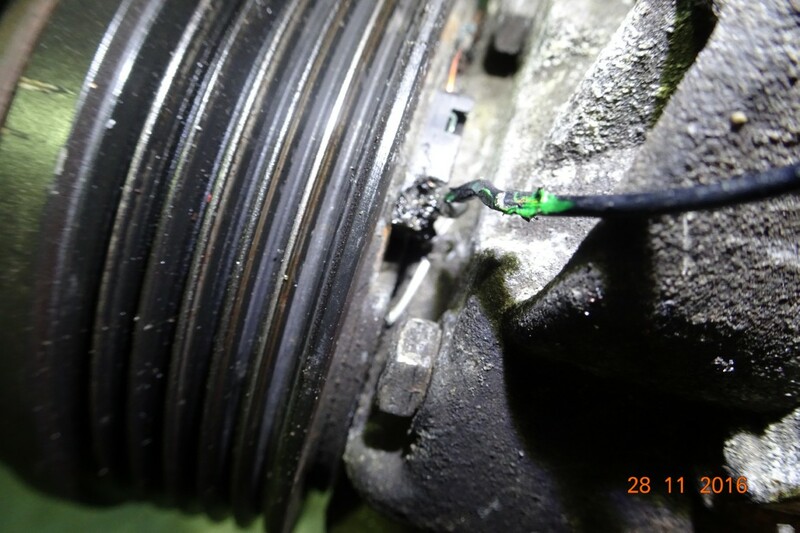 It was cable tied to another wire - which had the crank position sensor on it, still attached to it's connecting plug. I just new that I'd find it as soon as I ordered a new one. I tried to get the connector off but it won't move, which is why I removed the sensor from the block still attached to the connector. OK, next job to fit the new hoses that I've got. I open all the bags and find that they have'nt sent them all. Never mind, I'll fit the ones I have. Start with a small hose that connects the heater pipe to the thermo housing. I have to cut the old one off. I remove the spring clips and put them on the new hose. I then decide to clean the metal pipe so go to the cupboard to get some silicone rubber grease. Can't find it so use a bit of wet and dry to clean the rust off and then..... can't find the new hose. I spend half hour searching for it, I've put it down somewhere when I went to the cupboard, but where? I'll leave it for now as it will turn up if I stop looking. Next up is the fitting the lower ball joint and wheel bearing hubs I start on the left front but the sun is shining in my eyes and I can't see anything. So I go to the right front, same problem. Early lunch, it's 1200. After lunch I start again on the left front, I've soaked the lower ball joint in plus gas so it should be freed from rust... some chance, it's solid. I'm hitting it with a large chisel and big lump hammer and it's not moving. I decide to take the wheel bearing hub out. The four bolts are really tight but after a half hour of undoing them with a long bar I get the hub out. I then start on the lower joint. Suffice to say I've spent 3 hours hitting this joint with chissel and hammer to separate it from the main hub carrier, I've even had the oxy-acetyline on it to heat it. It will not move. See what I mean about staying in bed. I gave up at 1600 and soaked it in Plus Gas overnight. 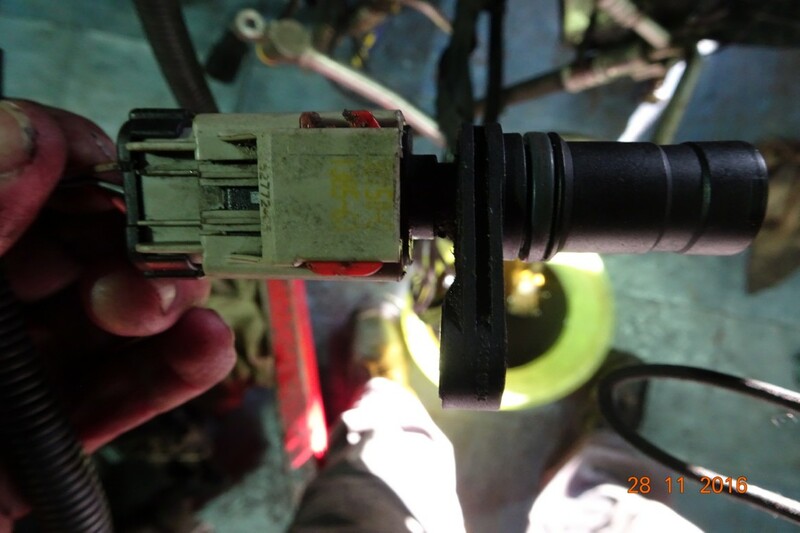 The crank position sensor, stuck on the end of the connector. The new wire soldered to the air-con compressor. Best I could do in the very restricted space. The front swivel housing with the bearing hub out. 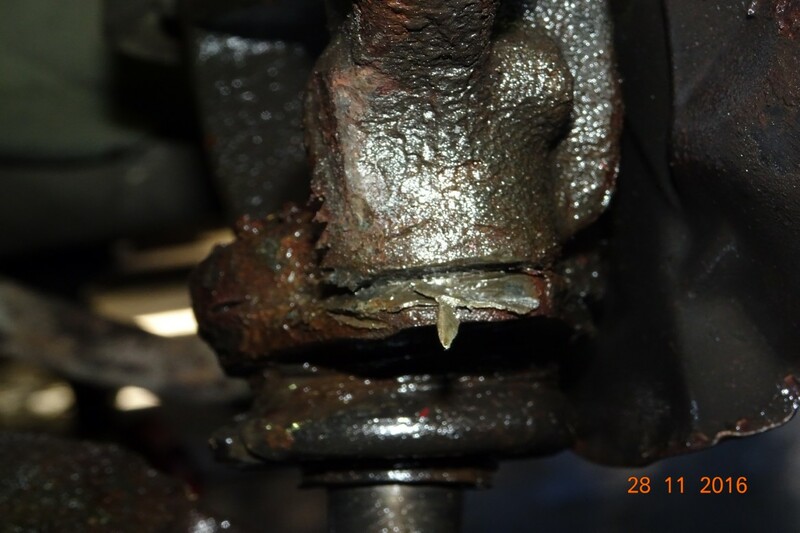 The lower ball joint rust welded to the swivel. Follow upwards from the pin which is in the lower wishbone and the joint is above the rubber dust cap. You can see the marks from the chisel. An end on picture of the joint. I may have to take the swivel assembly off to get the lower ball joint off on the bench. I'll have another go in the morning with Lynne holding the swivel so I can get a better hit at it. If that doesn't work the swivel will have to come off. 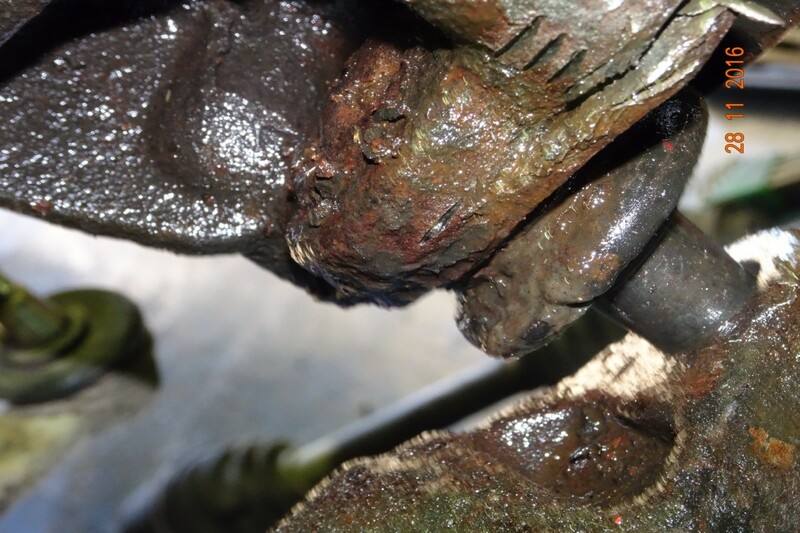 This is the new lower ball joint. 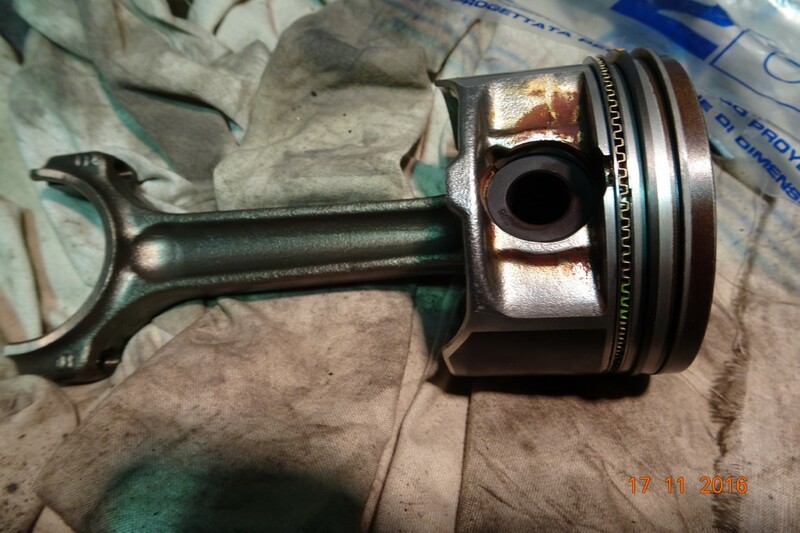 The end at the bottom of the picture is pushed into the swivel housing and held in with two bolts. 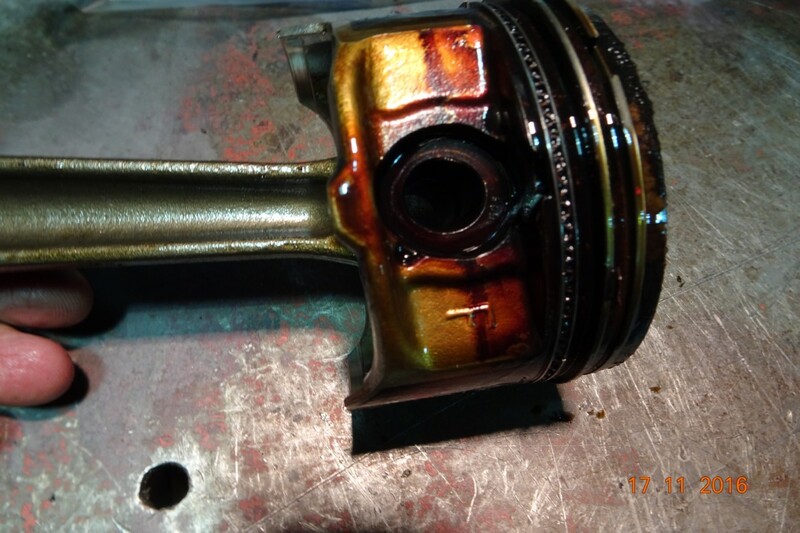 The "tube" area and the flange are rusted solid to the housing. As I've not been able to use my apnea mask for most of the month because the new one they gave me at the beginning of the month is much too high pressure and not having a phone for three weeks I've only just reported it, I hadn't slept well for two or three night and felt awful in the morning. No work on the car just sat in the chair sleeping most of the day. They are waiting for my doctor to give the go ahead to revert to my original pump. Straight after physio we set out to the motor factor in Angers to pick up the new alternator for the Mini. Then on to the BMW dealer to see if he'll send back the 79.20€ crank sensor which I've now found. He says he'll try so I ordered the hose and clips I've lost. Bet I find them before next Wednesday but I'll take them any way. We then went for a chinese at Atoll and afterwards went into Casterama to get a double socket for the phone cable so I can get both phone systems in the house working. We have a phone in every room... don't ask why!. They have a Christmas snowman outside the store. Big or what? Ever seen one that big? The snowman, not my gorgeous wife. OH well, another month gone. They do go faster when you get older. Move onto to December please.